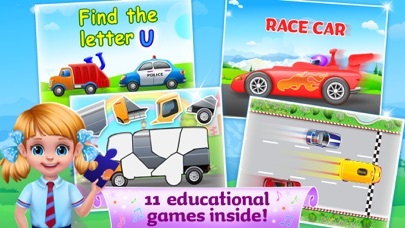 ~~> 12 fabulous games including the full sing along in one great kids app! ~~> 11 beautiful verses of the classic “The Wheels on the Bus” song! ~~> Adorable graphics and sounds! ~~> Top selling education app worldwide! An all in one activity center for children – complete child safe phone environment. 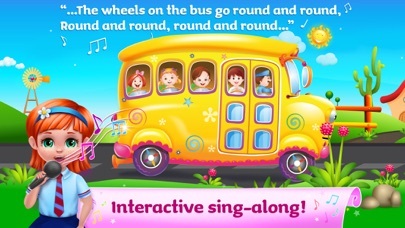 Enjoy the classic song, The Wheels on the Bus, with your little ones! With 11 beautiful and colorful verses filled with fun interactions, your children will play and learn at the same time! The 10 different games in the app provide hours of entertainment in which your children will not only have fun, but also develop their, memory, logic and fine motor skills. Wheels on the Bus is an intuitive and child friendly app filled with positive affirmation designed to boost self esteem and stimulate your child’s imagination. Play Road Trip! Collect puzzle pieces as you go to build as many vehicles as you can! 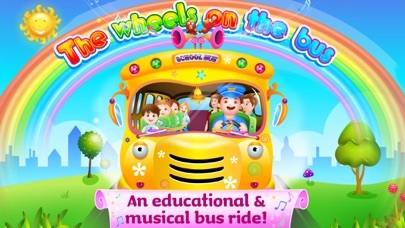 The classic “Wheels on the Bus” children song comes to life in an animated, interactive rich song and dance experience. Where are the letters hiding? Practice and train cognitive skills in this adorable and entertaining hide and seek game. Play and record your own music with the 5 different sets of horns on the honk piano. 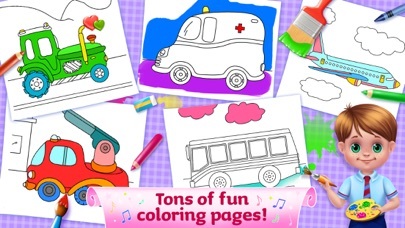 The happy race is on, select your car and race with 10 colorful cars in a vivid racing track. Tap your car to make it drive faster, the more you tap the faster it will drive. Five unique preschool math games. Presented with adorable cars that make learning basic concepts of math so much fun. Let’s learn vehicle names vehicle has its name, tap on the correct car every turn and move on to the next challenging and fun stage. High quality, super fun and simple to master puzzle game, with 12 unique vehicle puzzles. Intuitive, educational memory matching games. Match pairs of cars to learn their sounds and names. The bus ride driving simulator game lets your little ones feel like they are driving a real bus! Pick up all five passengers, while avoiding the road obstacles.